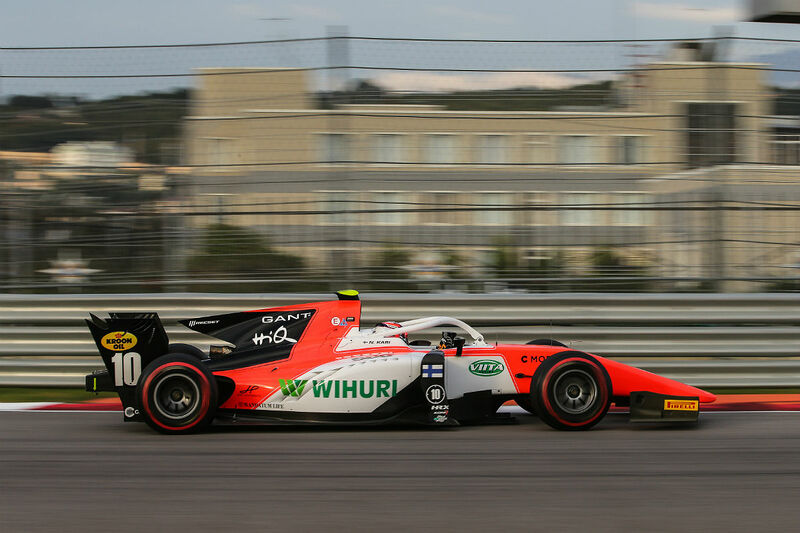 Niko Kari’s first weekend as a Formula 2 -driver taught an young talent a lot. The main thing was to gather as much experience as possible for the last weekend of the season. In qualifying Kari beat his team mate Dorian Boccolacci. Comparison between team mates is the easiest way to rate driver’s performance, and in Sochi Kari gets both thumbs up. On Saturday Kari drove his first race as a F2-driver. The race brought some new experiences, such as dealing with DRS and mandatory pit stops. They were no problem for Kari, who climbed all the way up and held second place briefly. After the pit stop Finn’s race was brought to premature end via technical problem. Sundays’ sprint race ended early, when Kari spun out on damp track. – It was totally my own mistake. One lap previously the track was dry, but the rain made it slippery and I lost the control, Kari told afrer the race. Even if both races could have ended with more satisfying results, is Kari happy to his overall performance. – I learned to understand the car better all the time. There is still some learning to be done, especially with tires, but we’ll get there. Kari enjoyed his time behind the wheels of Formula 2. – This car is damn cool to drive. There are a lot of things going on in races, pit stops mix things up and overtakes can be done thanks to DRS. Formula 2 season has one more race weekend left. Abu Dhabi is next in line, on November.